This week is Healthcare Appreciation Week at work and they like to be nice and give us snacks in the afternoon. 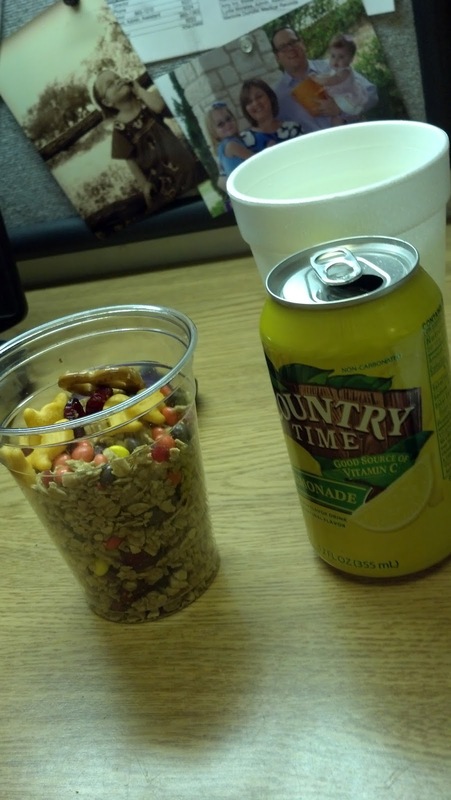 Today was make your own trail mix and lemonade. Well, of course its Country Time... duh, we are in Texas and its hot... like 95 degrees already everyday. The make your own trail mix was a great idea and to see us all lined up and it going so quick and easy made me think it would be great for a kids party, like maybe our Halloween party for the kids. It would actually be something all the other parents would not be mad about their kids taking home. :) Those are the ideas I LOVE and anything that Bailey can help with is awesome to her so this would be great for both of us. There were pretzels, some mms and mini reeses, goldfish, dried cranberries, granola, peanuts, dried apricots, raisins and pecans. You could easily add chocolate chips or yougart chips, dried blueberries, apple and banana chips for even more options. Its something the kids could scoop up on their own with some fun stuff, things we know they like and some healthly stuff all in one cup! I think this might also be a nice beach snack... glad I found this idea so I can make sure to stock up before our trip. Lately we have found a new favorite snack. We have been making "candy bars" with granola bars and smearing Nutella on top. Bailey loves it and doesn't know its not really chocolate. Its so quick and its good for her too!